The purpose of the meeting, which is mandated by state law, is to provide a forum to make community voices heard before a charter school opens. A decision cannot be officially made final until this hearing was held. 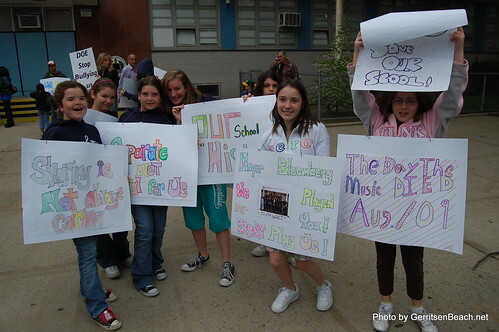 The meeting was packed with parents, local residents, elected officials, as well as clever sign holding I.S. 278 students, all of whom are opposed to the “proposed” plan. The auditorium, aisles, and surrounding stage were so packed that they started to turn people away at the door! 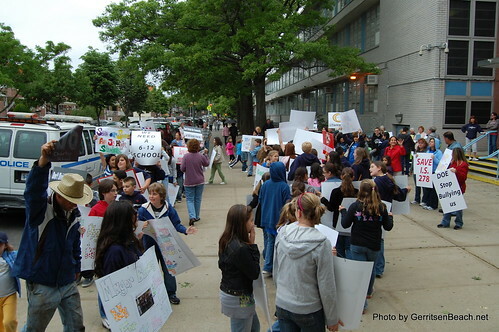 Before the meeting started there were there were protesting parents and children all holding signs forming picketing circles and chanting outside the building. Petitions were being finalized and tallied, the grand total was about 6,441 signatures! The meeting was run fairly smoothly considering the crowds emotions. The only “not so smooth part” was when the crowd harshly attacked the Spanish translator for offering her services to anyone Spanish speakers. The crowd didn’t like that at all and berated her to speak in English. 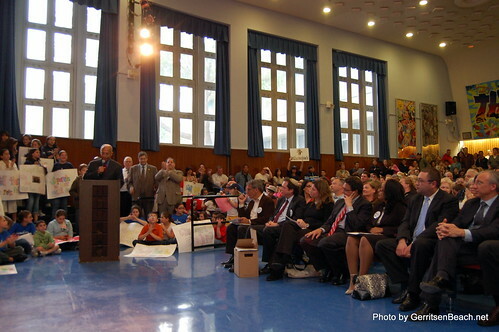 Comptroller William C. Thompson, Jr., who has aspirations to be NYC mayor, is for charter schools but against this one in this building, made a speech denouncing this charter school in IS 278 and mayoral control of the process. He is demanding more time to discuss and address community concerns. 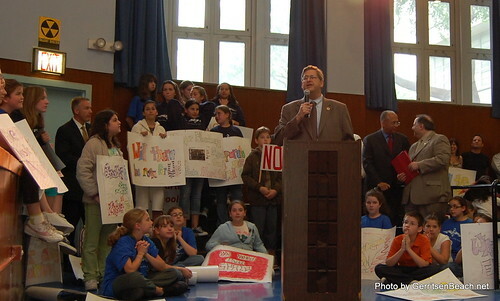 City Councilman Lew Fidler, against all charter schools, has been opposed to this school from the start. He thanked Mr. White for coming down to be the designated pinata. Adding that there wont be a “wide variety” of viewpoints that the community is absolutely united against this “proposal”. Lew ended with that 300 parents applied for the school without a building so DOE needs to put it someplace else. Congressman Anthony Weiner, who just dropped out of the race for NYC mayor is for charter schools but wants more time to discuss the HLA with the DOE. State Senator Marty Golden, drove 3:30 hours from Albany to show his opposition, he is also for charter schools but against this one. He is one of the more vocal and involved officials, holding a town hall, he spoke about mayoral control. It didn’t help that one Fox5 showed up and disrupted his speech and two the that the kids bum rushed the stage with a “save our school” chant. Members of the Hebrew Language Academy Charter School were also in attendance. 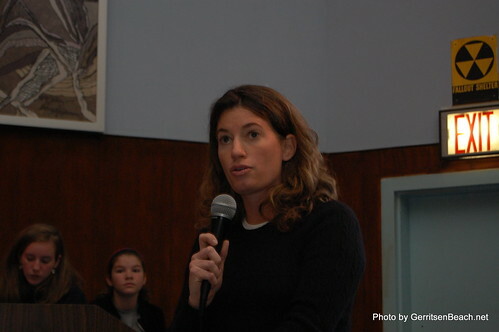 Lead Applicant Sara Berman, Principal Maureen Gonzalez-Campbell, and a handful of brave parents all made statements to the crowd. 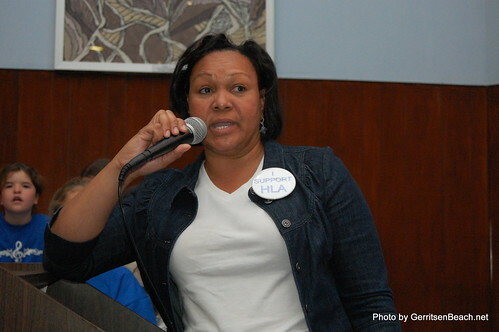 My Husband is Caribbean, I have the right to send my child to HLA. Right off the bat before the speakers list, 6,441 signatures were handed over by parents over to DOE’s John White. Apologies for the amount video and pictures in this post. GerritsenBeach.net and MarineParker.net will be updating their posts with more analysis and commentary shortly. Incredible write up. Thank you for putting this out there, especially for people like me that could not make the meeting due to work. Nothing is more informative than getting the words, opinions and information straight from the people who give it. Well done! I was glad to be there in support of my kids school, but I have to say I was really embarrassed by the way so many people behaved. 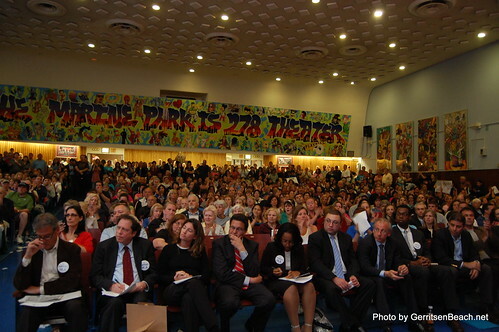 I really felt uncomfortable when so many people interrupted the charter school speakers and shouted insults and taunts. I had hoped my community was better than that. I have to lay the fullest blame, though, on the DOE representatives who would supposed to be running the thing. They didn’t impose any order, they didn’t set any time limits, and they didn’t seem to put any limit on the number of speakers. Every well-run meeting I’ve ever attended has those things. There was no reason why this should have lasted until 9:45 at night. At least I don’t think we have to worry about the charter school in our school, but I do hope they find another place. I can’t believe they would choose to come into our school if they had any other options. @Jeanine, I agree the meeting wasn’t run the way it should have been. Speakers were permitted from HLA who did not sign in before the list was closed. Speakers who didn’t give last names were allowed to speak so I don’t see how could an accurate record be kept. To have as many elected officials speak as did, it would have been difficult to fit in the speakers from the community, who were trying to cover all of the specific points. To her credit, Ms. Berman agreed to stay to hear everyone. There were a few hecklers and emotional responses but the insensitive and divisive statements made by representatives of the HLA were actually planned in advance and written in their speeches. There is no excuse for them. I think our speakers, for the most part, stayed on point and were respectful of people who have shown little respect for our community. For them to imply that we could become violent or were intolerant was inexcusable. 900 people showed up on Tuesday night- where else could you have an emotional group of close to 1000 behave the way our community did. I wasn’t embarrassed, I was proud. I was glad to be there in support of the community and even happier to see my elected officals, those who showed, stand up for the people rather than special interest groups. With regards to crowd’s unwillingness to listen to the HLA, I have seen no evidence that the HLA has had an open hear to the community. I am not going to lose any sleep over it. Sorry you could not make it Nick. Next time I see you I’ll give you my play by play. Thanks so much Dan for all the ongoing press of this issue! The fight is not over yet folks, next step is this Sunday, May 31st. We will assemble at 278 @ 11:00 a.m. with hand-held signs (pls. make them and carry them with you) — we will “walk” from 278 over to Bloomberg’s new office on Flatbush and R — if you are unable to walk, pls. meet us there at 12:00 — we want to overwhelm his “open-house” with residents who are VEHEMENTLY OPPOSED to the co-housing of the HLA in 278. The more, the merrier so please tell everyone about this event! It should be finished by 12:30 — it’s just a small amount of time but we are hoping to get a BIG turn-out so they are better able to hear our concerns! Thank you Mardie for the information. Count me in and as many as I can convince to join me. I personally thought it went well. And why shouldn’t our children have the right to voice there opinions besides the fact us parents all have made it known from the beginning. And honestly who cares if her husband is Caribbean and her children have the right to go to a HLA school that’s all well and fine, BUT remember that our children were here in this school first and I have rights also. We need more room ourselves here in this school and neighborhood for our children. I’ll worry about my own first thank you. Is it me or does Marty Golden start every speech explaining that he drove 3 & 1/2 hours from Albany just to be at whatever meeting it is? First, calling for “tolerance” at the beginning of the meeting and “open minds” – that in and of itself was insulting and degrading to the community… basically, you pre-judged the crowd before one word was uttered. That’s pretty much the definition of prejudice, isn’t it? For a moment, forget that the process has been less than transparent. Forget that the community was ill-informed then and now. Forget about mayoral control and all of the political buzz words and nonsense (by the way, nothing brings out the politicians like an opportunity to trash another politician, huh? :-) ). Forget the pre-judgments and all that junk. Think of those young children and ask yourself – What responsible parent would want his/her child coming into an atmosphere like this? It’s an atmosphere where (1) you don’t know what will happen in the next two years, where (2) facilities are taken from other students and they are now deprived of educational resources, where (3) these youngsters have to share space in a building made for and filled with children NINE YEARS their senior who see them as interlopers. And just to emphasize, this is all happening in their formative years – where many of them are first leaving mom and dad for school? To me, it not only sounds like a raw deal for those youngsters enrolled in IS 278, but it’s a substandard situation for those young impressionable children in the HLA. I’m not a parent, but I hope to be one someday, but I wouldn’t subject a child to those conditions, and I think those who do are not acting in the child’s best interests. Finally, as a person from a neighboring community, I was very impressed by the organization of the IS 278 Parent’s Association and the Marine Park community as a whole. This issue reaches beyond neighborhood borders and effects all children and parents in District 22, and they did a fine job reaching beyond their borders and seeking support from everyone. I agree Gene. I really do not appreciate the representative form the HLA who said that members of the community would want to, “firebomb” her house for supporting the charter school. I found that more insulting than anything else that was said Tuesday evening. After listening to their sales pitch I not only agree with you that the HLA came off as prejudice but hypocritical aswell. @Tom McCormick, That comment was totally uncalled for… it was like someone trying to pick a fight, IMO. The other thing that’s really bothering me is the way the neighborhood is embracing the politicians for coming out against this charter school. I’d like to know why they all weren’t more pro-active in informing the community of this school’s progress. That’s their job! Why did the community have to be blindsided? And then, once we’re so deep in the process, they get out in front of everyone and proclaim their shock and dismay at the Mayor. Lest we all forget, this is an election year – and I guess any chance you can get to bash the Mayor is well worth it for our local elected officials. I guess my point is that while we should all hold the Mayor’s feet to the fire in all of this and continue on the path before us, I don’t think that any politician should get a “pass” from the community. They all collectively dropped the ball. I am not sure myself, at what point which local politician would have been in the loop about the charter school or what power they would have had to veto it. Your point is a valid that should be addressed. If any of our elected officals are caught double talking or asleep at the wheel then I will bring the torches. I simply do not know about the process so I can not intelligently comment on it. I do know that some of the politicans, with out naming names, that were at the meeting on Tuesday evening have voiced their opposition against the HLA for some time but there were a couple of politicans there that were late to the fight. I think the political presence Tuesday lent weight to our cause. I do not think that the HLA expected such heavy weights to be present and to champion the community. That was their arrogance. In the end if any politician can stop this charter school from going through, that is all I ask. My son, a former student at PS 277, now in the 10th grade at Rachel Carson HS, was disappointed when he did not get into his chosen middle school and was sent to PS 278. Once there however, we were both surprised at what a good school it turned out to be. His teachers and the principal were very approachable and the teaching outstanding. I think that more families should consider this school a top pick for their children. Not only is the school local, but safe and clean. @neighbor, I’m with you. This is something we’ve been trying to convince the community of for a long time. Everyone who’s so set on getting their kid into schools like Mark Twain should realize that the school is only as good as the students in it. Our school has plenty to offer and if our kids were here, the scores would be comparable. These are kids who graduated from the finest elementary schools in the district. Why would parents think their scores would drop at 278 with their outstanding staff backing up a principal who is always willing to go the extra mile? We have a jewel right here in walking distance- use it before it’s taken from us. Has the D.o.E. planned for the possibility that the enrollment at 278 might increase in the coming years rather than continue to decline? With the current economic forcast what working family would not rather save tution money by sending their children to a safe, clean, and effective public school? If the HLA is successful in it’s goal then will future neighborhood children who wish to attend 278 be declined a seat due to overcrowding? Why not take advantage of the current enrollemnt levels to lower class sizes? If enrollmemt picks up or the plan for the high school goes through the smaller classes could be reestablished to conventional sized classes. Think of the education a child in a room with less than twenty students would recieve? There are so many things that the available space at 278 could be used for. Why not utilize it for a program that the entire community would be interested in? My sophomore year of high school was spent at an elementary school in the Bronx because the high school, Bronx Science, had run out of space, so half the sophomore class was housed in this building which was dubbed “The Annex.” I don’t recall any problems with the little kids and the H.S. students, but then Bronx Science students were regarded as geeks and nerds and probably were no match for the little kids anyway. The real problem was with the high school kids who were separated from half their classmates, not to mention the upperclassmen, and never got the feeling of being in one of NY’s great schools. While times have changed, I’m not too concerned about the safety of the little kids. Nevertheless, my problems with this are threefold: First, IS 278 is not underutilized, so adding 15% more students would make the school 15% overcrowded. Next year, another 150 students would make the school 30% overcrowded (the HLA school is supposed to find a new home after that.) Second, this project appears to be rammed down Brooklyn’s throat by Mayor For Life Mike, with predictable results on the part of the rammees. Third, and most important, this school appears to be an end run around the Establishment Clause of the Constitution, and thus makes a perfect case for school vouchers. Sara Berman seems to be a lovely lady; too bad she was made to be the designated pinata here. Placing the HLA academy in IS 278 makes as much sense as closing off Broadway to traffic, another of Mayor for Life Mike’s hobbyhorses. I do not feel that the HLA represented themselves well Tuesday evening but at least they showed up. With no disrespect intended to Mr. White from the D.o.E. I was hoping to see the chancellor and the deputy mayor and/or the mayor himself there aswell. For one, I did not learn any new information regarding the charter school that I did not already know from previous meetings aside from a few names and faces of those working with the HLA. Neither their handouts nor their speakers sold me on the proposal as to why this cultural school would benifit the ENITRE community and more importantly why it should be housed in I.S. 278 above any alternate location. I do not feel that any of the HLA speakers adaquately addressed any of the concerns presented by the community regarding the HLA being housed in I.S. 278. Their general attitude towards the community was, explain to us we can’t or shouldn’t have the HLA in I.S. 278? That attitude that this was something that the HLA was entitled to rubbed me the wrong way. Ungrateful is a word that comes to mind. Again that was my personal impression. It was their proposal to sell to US not the other way around. The HLA needs I.S. 278, I.S. 278 does not need the HLA. Mrs. Berman’s speach alone did mention some of our questions and concerns but to me it was lacking in concrete facts to support the claims that the HLA genuinly consulted the community’s input and offered a fair registration practice. I was not convinced that other locations were thoroughly explored. Lastly, if the HLA is being honest that it will only take only two years to establish itself in it’s own private facility I don’t understand why those who are interested in this charter school are not willing to wait until that is done? What is the pressing need to rush this program into an established middle school on a temporary basis of only 24 months? I fail to see the logic in this. For a new school to begin this way is absurd. I am not in favor of charter schools in general and these cultural agenda schools leave a bad taste in my mouth. This particular cultural charter school is something of an enigma. For one, I.S. 278 is a successful school and does not warrant a charter school. Secondly, this cultural school, unlike it’s predacessors, does not apeal to the overwhelming majority of the community, nor it it welcomed. Charter schoos have students of parents who care. This leaves the public school systyem with children of parents who don’t care. So for that reason the public schools don’t work. That does not mean we should have charter schools ,but instead correct the problem and have the parents involved. And if not, those students should be delt with as should the parents. You are leaving the teachers with the lowest level of students with parents who don’t care. You have to stop charter schools, it is not working for the rest of the public school population. The charter schools are also effecting the private religious schools. Why send your child to a private school when the Board of Ed will educate your child in thier private schools(Charter Schools). This is ruining our status of education. 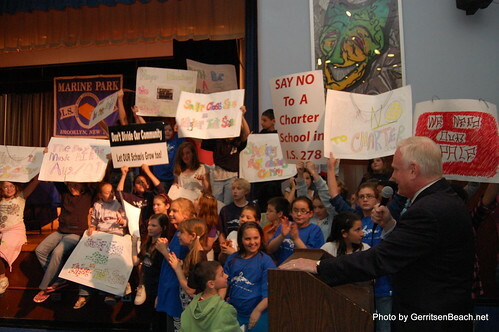 I have always been against charter schools myself. In my opinon, while they do help a percentage of children in troubled public schools they seem to avoid dealing with the real problem facing the public school system. The D.o.E. is responsible to educate ALL of the children in this city in an enviornment condusive to learning. Yes parent and student involvement are equally important. Throwing a life preserver to a few children is not the solutution. Lately the idea of charter schools has morphed into cultural endeavors and in worst case scenarios religious endeavors. Neither of which should be the obligation of the public school system, at least not at the expense of the basics of Reading and Writting (in English), Math (in all of it’s forms), History, Philosophy, Social Studies, Geography, and the Sciences, not forgeting Physical Education. Music and Art also are equally important to any successful society. Keep religion out of the public school system period. If the DoE wants to offer cultural based classes to enrich students of other cultures is a great idea but they should offer classes on ALL of the many cultures in this great city and offer them as elective classes or extra-cirriculum classes, not charter schools geared around non -American cultures. The basics building blocks of education should be more important than feel-good political correctness. American standardized high school test scores, especially in Math and Science, are laughable compared to the rest of the modernized countires of the globe. With the new global economy competiton for good jobs will be fierce as jobs are increasingly offered to a larger portion of the globe while companies expand beyond our country’s boarders. It is a competition that, at the current rate, our children will be ill suited to compete in. This country, thanks to it’s great ethnic and religious diversity, has contributed greatly to the cultural institutions of the world over the past two hundred plus years. We have done so without cultural specialized charter schools. Why do we need them now? P.S. I hope all is well with you. @Tom McCormick, So many great ideas here. One of the reasons Americans can’t compete at a higher level in high school years is because students spend years being taught to pass reading tests rather than any real information. Administrators are so busy manipulating scores and endlessly “assessing” that they tie educators hands when it comes to real teaching. It’s time to get the bean counters out of education and put the educators back in. Yes, all to often we see the arbitrary columns of numbers that are supposed to indicate success,or failure, take precedent or are even manipulated over the purpose they were intented for in the fist place. Unfortunately this is not an issue isolated to the public school system. I personally see charter schools as nothing less than out-sourcing of our education system to the private interests for political reasons. I think charter schools are a gateway to infect the eductaion system with the corporate model that has already left a trail of bodies in it’s wake. The school system ran best when it was run by professional educators. I feel you and Tom are definitely on the money concerning the problems we have with our educational system, although thereâ€™s one problem that seems to be absent from your observations and thatâ€™s parent participation in their childâ€™s education. My wife, an educator for over 27 years, has notice a definite decline in parentâ€™s involvement with their childrenâ€™s education. Over the years she has determined almost without exception that when parents are strongly involved in their childrenâ€™s education, those childrenâ€™s grades are higher, they participate with classroom activities more, get along with other children better and they generally enjoy going to school. Apparently the people in charge fine this issue too controversial in this politically correct world we live in today. So every year or so, generally around election time, they come out with a new miracle scheme of fixing our educational system. Then the games began with each side blaming each other, the teachers complaining that they need more money so they can teach better and the politicians demanding to implement ways of blaming the teachers for the childrenâ€™s failures. So today we have teaching for tests, charter schools, remedial education, bilingual courses and the list goes on and on while each year the dropout rates continued to increase while the cost to taxpayers also increases. What a city. @trainman, The DOE is well aware of the significance of parent involvement but they’re just too busy being baby-sitters to expect accountability. When they don’t close the school even though there are sheets of ice or feet of snow, their excuse is always, “What will working parents do?” Let parents figure out their own solutions and maybe they won’t require hand-holding any more. I was told at the last round of Parent-Teacher conferences that it’s always the same parents who show up and they’re usually not the ones teachers need to see. I’m not surprised. So, whatâ€™s the answer? Is it that the politicians are more concern about the political repercussions from alienating parents who rely on the school system to be as much babysitters as educators? If so, whatâ€™s all this rhetoric about? Weâ€™re all worked up in this game of blame calling while the true culprits of this and many other problems we have with this city and this country is the way our politicians, besides raising money, try not to alienate as many people as possible regardless of the consequences, we as taxpayers, must endure. That old saying truly applies here that we â€œcanâ€™t see the forest through the treesâ€. We as voters need to wake up and stop reelecting the same self-serving bureaucrats into office. We need to give them one term and if they donâ€™t make a difference, we vote them out otherwise we truly deserve the quality, or lack of, life we have here in this city. Without a doubt you are correct. The proof that you and your wife are correct concerning parental and student involvement is right here in district 22. I do not have facts to quote from but let us assume that the teachers in this district are a good sample of the teachers throughout the city. We all know that we have a great facutly. Their hard work and efforts are herculian to say the least. Let us also assume that in this dictrict the facilities that we have to work with are the same as what the D.o.E. offers other districts. What then accounts for the success of this district over some other school districts assuming all things being equal? Student and parental involvement. I think that in order to be successful every school needs 1. a good faculty, 2. a clean, functioning, and safe facility(from building to books), 3. an eager and respectful student body and 4. a supportive parental body. To be fair to the D.o.E. they only supply the first two. I won’t presume to know why the parental involvement has declined of late but the impact is evident in some districts. There are no easy “diet pill” fixes that will save our education system despite what anyone wants to sell you. Real fixes require time, money, and most of all diligence. You can only put a band-aid over a problem for so long before that problem grows out of control. I guess it is easier for the powers that be to pass a miracle scheme for the day than to enforce a system that worked well for generations before. When people fail those of little character will look for an excuse. There will always be someone looking for votes that will offer to change the system to accommodate the squeeky wheels who don’t want to play by the rules or have the same expectations that everyone else does. In my opinon, that is why we have cultural based charter schools. @Tom McCormick, I’d have to say, though that the DOE does drop the ball in providing at least #2 and sometimes #1 as well. One of the reasons this district performs so well is that when the DOE falls short on providing things, parents pick up the slack. When my husband’s co-worker switched her child over to P.S. 222 because the reputation was better than his previous school, she did nothing but complain about the fundraisers and lists of supplies requests that kept it that way. If the teachers needed computer paper or soap or wipes, all they have to do is ask in schools with involved parents. And before someone says we have more money, let me tell you, we all don’t, it’s a matter of priorities. If you can afford $200 sneakers, cigarettes and lottery tickets, you can afford a roll of paper towel for your kids class. Maybe it shouldn’t be that way, parents picking up the slack, but we do it for our kids. That’s why the DOE has never seen fit to consider our needs before now- we just take care of things ourselves. They should have appreciated this all along. It is disgusting that teachers and parents have to reach into their pockets to supliment such basic needs in the class room. Thankfully for our children’s sake we are in district where the parents care enough to make up the difference. Sneakers are that expensive now? I’ll just stick to my REEFS. @Tom McCormick, Charter schools started out as a good idea, but unfortunately, politicians saw it as a cure-all for educational issues and started abusing their discretion in recommending them where they were not needed – like here. If used properly, I still think that charter schools can be a useful tool in improving the overall educational landscape of a given area. One element to add to the discussion – Something that I feel should be re-examined is the loss of power of the Principal in a school when it comes to enforcing educational standards and the increase in UFT influence over the everyday school experience. 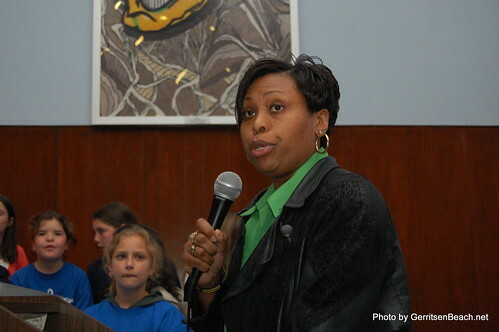 Principals are simply administrators now. I’m not THAT old (will be 31 in June), but I do remember a time when teachers were taken to task when grades fell or they were doing a poor job. Nowadays, there are so many built-in protections to a teacher’s job that we now give bonuses when they actually do their job and kids learn something! Heavens forbid that you chastise a teacher and have a grievance filed. This also contributes to the apathy of some parents, in my opinion. In the end, education is what you make of it. I always tell people that thanks to Sheepshead Bay HS, I received a year’s worth of college credit, and they’re shocked… not by the amount of credits, but the fact that it happened in Sheepshead! I will agree with that. It is upsetting to me aswell that the D.o.E. 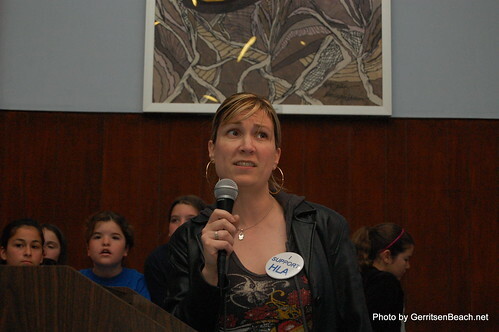 is quick to use charter schools as a template to solve problems within the school system. I think it alleviates the system of coming up with new innovative solutions to existing and arising problems. I do not teach. I am not familiar with the UFT’s contract nor their job as a whole so take my commentary with a grain of salt. Of course teachers like any equally important profession should be accountable for their performance. I am not familiar with the current nor the old system of how teachers are evaluated or protected. Before we hand out grades though I think the way we evaluate theachers should be executed with some wisdom. For one, the greatest teacher in the system can have a class that is unwilling to learn or behave and an average teacher can have a very eager to learn respectful class. How would we determine if the issue is with the teacher or the students? Not all classrooms are filled with the same children. What would be the incentive for a great teacher to teach children that may be eager to learn but need to go a bit more slowly or need that extra help if it may reflect poorly on that teacher’s evaluation? Certainly students who need that extra help would need a fantastic teacher and the difficulty should be rewarded not punished. I am not pretending to have the answers to the questions of how we should evaluate our teachers. I want to point out that we should not be so hastey in doing so. I am sure the process can be frustrating for a parent with a legitimate gripe with a teacher. I am not belittling that. A student in this community went through a nightmareish ordeal in another district and the student’s family was powerless against the school. I can definitely see how that would put off any parent. I watched a news program, it might have been 60 Minuets, about a year ago where Chancellor Klein was interviewed. His plan for evaluating the schools was riddiculed and rightfully so. To sum up his plan a school in Staten Island that had on average scored in the ninties out of a hundred on tests was considered a FAILING school because it got the same test scores the following year and did not imporve. Another school was touted a success for increasing it’s test scores from sixty to sixty five. The improvement should be appluaded but this grading system was completely insane. I am not sure if this system is still implemented. My point being that while teachers should be held accountable for their performance I have not seen anything comming from the D.o.E. that would satisfy me that any system of evaluation would be handled intellegently at all. Lastly Gene you have bested every point of view in this discuccion with your final statement. Education is, in the end, what you make of it. I could not agree more. Interesting point regarding the effect on private religious schools. One that I had not considered. Imagine now, if these charter schools, at least the cultural and religious based charter schools actually caused perochial schools of all different religions to unite under one common goal. My son graduated from Sheepshead Bay HS. I’m not saying that it is a bad school, however being a minority (meaning white), he did not bond with students, he survived. The staff there, is probably not among the chosen. Most of his teachers spoke English as a second language which made it very difficult to understand Science, Math etc. His grades were horrible, which was his fault and he attended night classes to make up credits. He graduated a year early, passing regents. I have no idea how, since he can not spell. He is a nice kid who was liked by his teachers and I believe that they gave him higher grades than deserved. He is now in the marines. 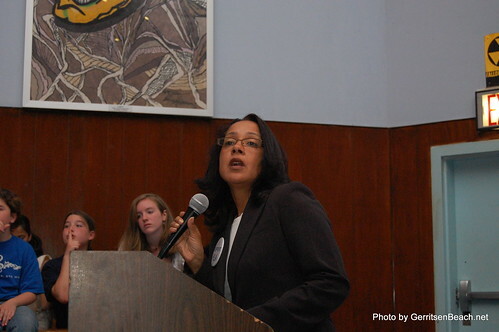 NYC Schools teach children to pass tests to give their schools high rating. I grew up in Jersey and received a much better public school education. Taxes paid for all school supplies from books to pencil and paints. There is something wrong when supposedly we live in one of the best and wealthiest cities in the world and parents have to supply hand soap and computer paper for their childrens class rooms. Once again, instead of protesting, we do what we think is best for our children, however there are many schools where parents can not afford even to send paper because they live in poverty and struggle just to survive. Where does all the money from the State Lottery go? Not to education, that’s for sure. Last I read, less than one half of one percent of the taxes raised by the New York State Lottery actually make it to the school system. I am not sure if that ment the city schools or the entire state. Either way those numbers are pathetic. I guess in order for the wealthy to remain wealthy the money has to come from somewhere. Someone please respond, “does this “not wanting a charter school”, have anything to do with Marine Park’s opinion on the Jews moving in? @Marine Parker, Yeah, I’ll respond. “Not wanting a charter school” means just that. There were good points made by several posters on this thread and a previous thread that argued against a charter school in Marine Park. Read through them and you will see a handful of small minded comments but the overwhelming majority were fair. It’s unfair and ignorant of you to make the unfounded leap from not wanting a charter school to implying that this must mean that the Marine Park Community is intolerant. I have two words for you, puh lease!